This was the theme of this week's Recipe card challenge on Julie's recipe card challenge blog. I'm really not the elegant dinner party kind of gal so this was a challenge for me. Both in the recipe and in the creation of the card. But this is supposed to be about making it a challenge, right? Thanks for stopping by today! Check out the rest of the rest of the recipe challenge cards here. This week's challenge on the Recipe card challenge blog was to create a recipe card with a recipe that has flowers in it or a card that has flowers in it. I opted for the recipe card with flowers on it. I have these recipes that I want to try that I used for my recipe card. They are Cilantro-Lime Rice and Black Beans. They kind of go together so I made a pocket on my recipe card so I could tuck the second one in there. The cardstock is Kiwi Kiss, Old Olive, Whisper White, and Melon Mambo(tag) from Stampin' Up!. The designer paper and strip of glittered flowers going across is the Carolyn Gavin line by K&Co. The layered flower is also by K&Co. Check out what the rest of the design team came up with on Julies Recipe card challenge blog. This week's challenge for the Recipe Challenge blog was to creat a recipe card themed with the great outdoors and camping in mind. I immediately knew what recipe I was going to create my card around! Brownie S'mores! These puppies are delish! See that bear with his arms spread wide? That's him telling you how big a piece of brownie s'mores he wants. Yep, they're that good! I will give you the recipe of the recipe card and then the recipe of the brownie s'mores. Sound good? Recipe All Supplies are from Stampin' Up! Now go check out the rest of the recipe cards on Julie's Recipe Card challenge blog! This week's recipe card challenge on Julie's Recipe Card Challenge blog is to create a card using Pink Lemonade as your inspiration. I instantly thought of the new Raspberry Lemonade designer paper from Stampin' Up! Then I went in search of a recipe that would fit this theme. The Lemon Raspberry cake recipe seemed to be just the right thing. I haven't tried this recipe yet but it sounds pretty yummy! Other: Stickles, PInk Glitz frosting, 1 1/4" circle punch, dazzling diamonds glitter. You can order the stickes and Pink Glitz frosting from Julies store. She gives excellent customer service and ships out fast! Check out what the rest of the design team came up with on theRecipe challenge blog. We'd love to see what you came up with too! Whew! Can you believe we are on recipe challenge#50? Unfortunately, this is the last recipe challenge for awhile. Tamara's taking a break from the recipe challenges for a few months but she will be back in late July/early August with a design team call. You may want to give it a try! I thought it was appropriate to end this recipe challenge team with a cupcake card cuz I love 'em! This cupcake is from the Michael's dollar spot a few months back. I stamped the journaling tag on white cardstock and the cut it out and punched the edge with the spiral edge punch. This is my notebook paper. The dry embossing is hard to see - the background paper is dry embossed with large dots and the flowers are embosslits that are embossed and then punched out with my boho blossoms punch. The cupcake is colored in with copic markers. Check out what the rest of the Recipe challenge team came up with on Tamara's blog. We had a beautiful Memorial weekend here in Minnesota. Unfortunately my son, Nick got the flu. He's out sick from school today. Hopefully, he'll be back in school tomorrow. The circle scallop die folded in half to form a circle was a natural for this card. I cut out Real Red cardstock with my circles plus circle cutter and the Rockabilly designer paper with the same size circle. I then cut this circle in half and glued black ric rac across the middle. The tart and tangy cherries in kiwi kiss and real red finishes it off. Check out what the rest of the design team did with this challenge on Tamara's blog! It's been a tough week. I had a friend pass away unexpectedly last Tuesday. She was only 40 years old. She left behind a husband and two sons ages 8 and 10. It's another reminder to live each day to the fullest and to tell your loved ones how much you love them. Life is short! All of the challenge is rolled into one element on my card - the butterfly. It's pink, it's a butterfly and it has glitter on it! I dusted off my Inspired by Nature stamp set for this card. I inked the leaves and stems in Kiwi Kiss. Then I removed the Kiwi Kiss that landed on the flowers with a qtip and took a marker in tempting turqoise, taken with teal and chocolate chip for the flowers. The greeting is from the oval all stamp set. Check out what the rest of the Recipe Design team has come up with this week on Tamara's blog! You can play along with the challenge too and show us what you came up with. We'd love to see your projects! 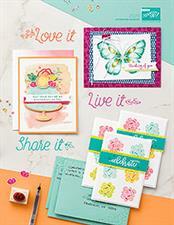 I just received this Love Owlways stamp set for FREE for my Sale-a-bration sales. It's such a cute set and because owls are winged things it worked for this challenge! The words on the chocolate band are rub-ons from the Cheery Chat rub-ons set and the stitching is going around the polka dot chocolate designer paper. Don't look too closely at my stitching. This is why I only got red ribbons for sewing in 4H. i never was much of a seamstress. lol! I had the Sizzix flower laying around in my craft room so I attached that with a sizzix button and that was that! I had my Big Shot VIP party on Sunday. We made 3 fun Big shot projects. I'll post those later this week. i can't get enough of my Big Shot! The base is chocolate chip cardstock. The patterned paper is some I just picked up a sale. The ribbon is from Michaels and the butterfly is a leftover I had from a pack of dimensional chipboard stickers. The greeting is a rub-on from the Cheery Chat rub-on pack. Check out what the rest of the design team came up with on Tamara's blog. My card couldn't be simpler. I used some paper from my stash and the celebrate everything stamp set. I stamped the numbers from taffy alphabet numbers and cut them out. It's going to a friend of my son who is oddly enough turning 11 in May. Go check out what the rest of the design team came up with on Tamara's blog here. I have been itching to get into my stamp room to stamp but I have been swamped with getting ready for my HUGE stamp sale this weekend. 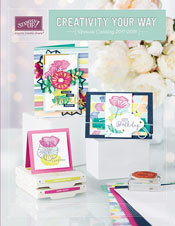 We literally have thousands of stamps, and papers, tools, punches, embellishments, etc. I'm going to post a few pictures tomorrow so you can get the idea of how huge is huge! You really have to see it to believe it. I'm hosting a Hawaiian Luau Mystery Hostess Party tomorrow night(crazy, I know) and I will post the projects we do from that this week. I hope to blog hop again soon too!